Print showing all NFL stadiums! Gorgeous, full-color map showing all team stadium logos at their respective locations. Makes a great football gift! **UPDATED** Includes the St. Louis Rams recent move to Los Angeles! We also have a similar "Tracking" Map which allows you to mark which stadiums you have visited. Search for Print# TFOOT1824TRK. Framed version uses our "Flat Black" moulding that is 1-1/2" wide. Standard mat color is red, but it can be changed upon request. 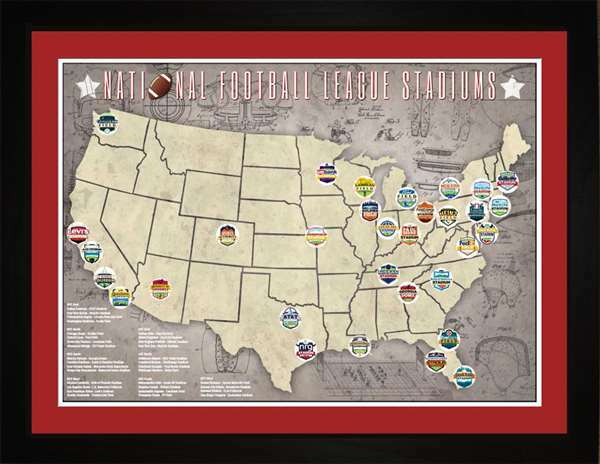 Overall frame size is 27" x 21"
Great full-color map to show the location of your favorite sports teams or events. Art is printed on premium acid-free paper. Framed art is presented in a high-quality wooden & glass frame. Makes great wall art for the home or office. Prints typically ship same day; framed art ships within 2-3 days. I highly recommend this company. I ordered something and when I got it, realized that I had ordered the wrong thing. When I called, they immediately helped me get the right thing ordered and did not charge me anything extra for MY mistake! Not many companies would go over and beyond and this company did without any hesitation.